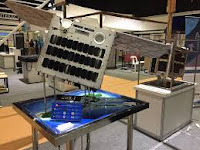 The "second century" of the amateur satellite program has begun with the christening of the Philippines-built Diwata-2 satellite as Philippine OSCAR-101, or PO-101. The microsatellite was launched from Japan in late October. According to the AMSAT News Service, the request for a OSCAR number follows successful testing of the satellite's amateur radio payload.